This term marks the end of the Art of Learning Project for the Year 1s and 2s as well as the Year 5s and 6s. We were lucky enough to have artists in residence to do fun activities with us each week. 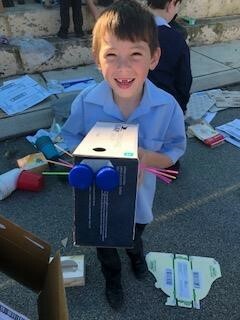 For HASS (History and Social Science) the Year 5s and 6s have been learning about how they can reduce waste and also recycle or reuse it. They have been collecting things like cardboard egg cartons, plastic bottles and bottle lids. Two weeks later they were told that the Year 5’s were going to make bowls out of the egg cartons, and the Year 5/6’s were going to make flowers out of plastic bottles. The Year 6’s were going to make wonderful pictures out of bottle lids. Now that we’re in the last week of term the bowls, flowers and pictures are pretty much finished. Next term hopefully we do more exciting things like this. Thank you Sue and Jodie, our talented artists in residence, for teaching and educating us about our waste problem and how we can recycle to make new products. The Year 1s and 2s have been busy working with their artist in residence too. Their artist, Adam, has helped them to use creativity and make learning fun. 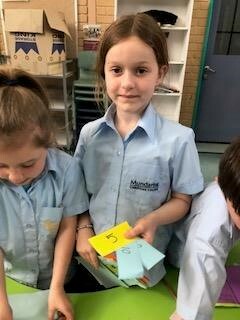 Below are some pictures and comments from the Year 1s. 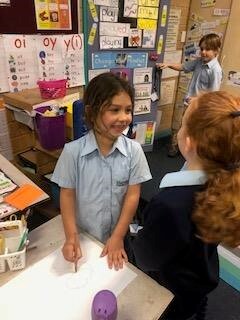 Lara- I had to draw a picture of April, but the trick was to not look at the paper and don't lift my hand off the paper. It was fun! Lizzie- I am busy constructing a ladybug. I used an egg carton and straws. Lola- We pretended to visit different countries. We had to buy a train, plane or a bus ticket using play money.